"Elegant Parisian architecture steps from the lakefront. Exclusive building with just 15 units. Generous floor plans ranging from 2,500 to over 6,000 square feet." 65 E Goethe is an eclectic French architectural style condominium building by architects at Lucien Lagrange. 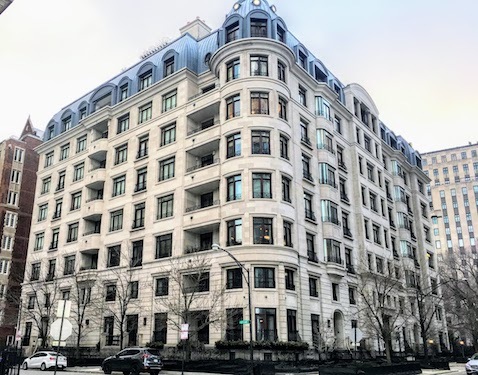 This distinctive property can be found in the heart of Chicago's elite Gold Coast neighborhood - just minutes to the lakefront and beach. Building amenities include 24-hour doorman service and and access to a beautifully landscaped rooftop garden with lake and city views. The units of 65 East Goethe are large, airy condominiums – all with multiple balconies. Finished residences feature luxury finishes and modern amenities. A few select units are raw, unfinished spaces that invite potential buyers to design their dream home. 65 E Goethe is pet friendly allowing both dogs and cats. Parking is included in the attached garage for as many as two vehicles.